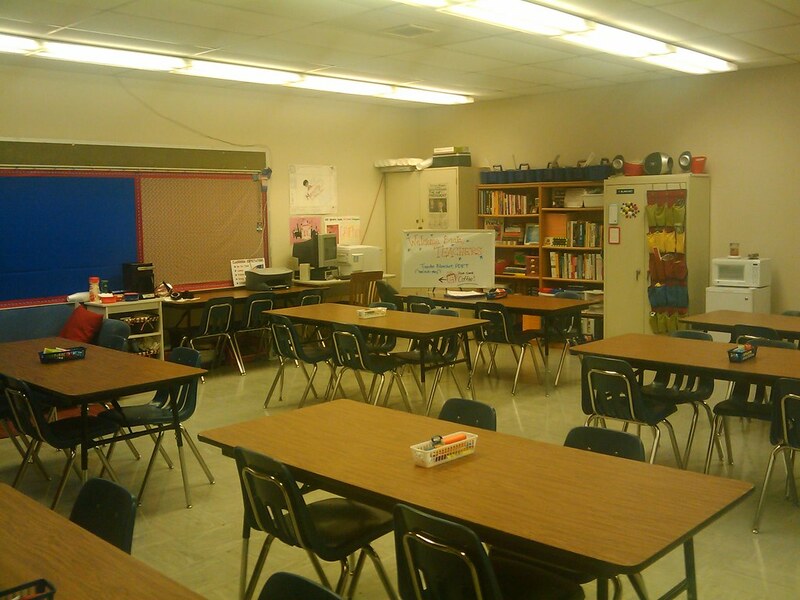 Thanks to Debbie Diller’s book, Spaces and Places, I was able to makeover my classroom–big time. My new job requires me to provide job-embedded professional development (training) for the almost 200-teacher faculty at my school. I am required to have the “model classroom” where teachers can come in anytime and observe the use of best practices, integration of technology, etc. I wanted to create a classroom environment that was not only functional and comfy for my kids, but also an inviting space for teachers to come hang out and watch me teach. When I first got my room assignment, I was somewhat disappointed at how small it was, especially when I saw that there were other classrooms around that were much bigger than mine, and given that I needed space for teachers to come in and two classes with 33 students apiece. I asked for a bigger room, and was told that it would be taken care of, but then I turned right around and started trying arrangements with the room I had, and began to realize that maybe I could make it work. What better way to build a model classroom than to have a small space and show what amazing things can be done when you have a plan? While the jury is still out on how the kids are going to react, I have gotten a lot of positive feedback from the teachers and staff who have passed through my room so far. This year really marks a shift in the way I approach my job. I am very thoughtful and calculating now where I was quick to act before thinking in the past. I guess I’m slowing down in my old age!!! I think I have a rationale for just about every aspect of my room, from the removal of the teacher desk, to the inclusion of a coffeemaker. I really feel energized and ready to start the year in my new classroom. I am so looking forward to hearing the reactions of my students and more teachers! Visit my flickr gallery here for more pics and info about my classroom makeover—I only wish I would’ve taken “before” photos!!! 1. To protect those brand-new pencils on the tables, I add a red tape flag to each (so they can’t be taken so easily). I use red electric tape from a dollar store and wrap it around the pencil to create a tape flag. So easy and effective! 2. One thing I do in my office to help me organize my many professional books is to put my books in labeled clear plastic shoeboxes on my shelves. This makes it really easy to find what I need. I’m thinking it might help teachers easily find what they need if they want to check out books on teaching Geometry, Statistics, etc. Just a thought. 3. Love the coffee station for teachers! They will, too! I’ve just begun my own blog, too. I would love to share your blog with others and expand the reach to high school, math, and PD coaches! Fabulous! Check it out at http://debbiediller.wordpress.com/ It may take a while for me to post it, but stay tuned. Thanks so much for writing to me! What a treat. I was working on writing my newest book on math stations (for K-2) when I decided to take a break and check my email. So glad I did. You’ve inspired me, too. Thx for the feedback, Debbie! Posted on August 8, 2009 Categories Guest Posts, personal updatesTags classroom, classroom design, classroom layout, classroom makeover, Debbie Diller, organization, Spaces and Places, video2 Comments on Extreme Classroom Makeover!